This month, I’m focusing on dealing with paper overwhelm. First I talked about dealing with the biggest paper gateway, THE MAIL. You can read my post about that here. That was followed up by how to handle your action item paperwork. This week, I’m going to talk about a long term filing solutions for all that paper you’re finished with, but need to hold on to. You may not realize that there are a lot of different ways to file paper. The way you do it now probably seems obvious to you. Working for many years as an organizer I’ve discovered different people come at it different ways. Like all organizing, the way you do it has a lot to do with your thinking and learning styles as well as how you were taught by your parents and teachers to look at things. Some of you simply have hanging files that say A, B, C, D, E… and everything is filed under its appropriate letter. Nice and simple unless you think ‘auto’ and your significant other thinks ‘car’. Some have a file that says “credit cards” and some have a file for every single card. Some color code green for financial records, red for health, orange or yellow for…what ever makes sense to them. If that’s working for you read no further. But if your files are bursting and you find that once a year or so you have to spend hours cleaning it out, maybe it’s time to re-think your system. We are living in a digital age to be sure, but this has not eliminated our need for good hard copies of lots of things. I’m not about to try and convince you to put all your important items in the cloud, or stop getting paper statements if that’s what works for your process. However – what you need to keep and for how long is different in our modern era and that means you need far less paper than you once did. The information contained in bank statements, utility bills, brokerage statements, credit card terms etc… can easily be found online, often more up-to-date and accurate that paper that is mailed to you. Basically, it breaks down into stuff you need short term, stuff you replace and stuff you keep for the long haul. A filing system built around these basic categories can be much easier to control and purge with minimal effort, because it kinda just purges itself. “But how can it do that, Anne! ?’ you say? Let me show ya. Brilliant as I am, I didn’t come up with this on my own. I learned it using a system called Freedom Filer. Full disclosure here, I’m an affiliate of this company, and so if people buy their product off my page, I get compensated for the referral. But please know that I never participate in an affiliate program that doesn’t represent a product I’ve tried and that I think works well. My mission is to help people get organized, not get a few extra bucks pushing products. I regularly recommend this to clients trying to deal with years of paper and it’s a system I use myself. It truly helps you get and keep your files under control – and it really is self-cleaning. 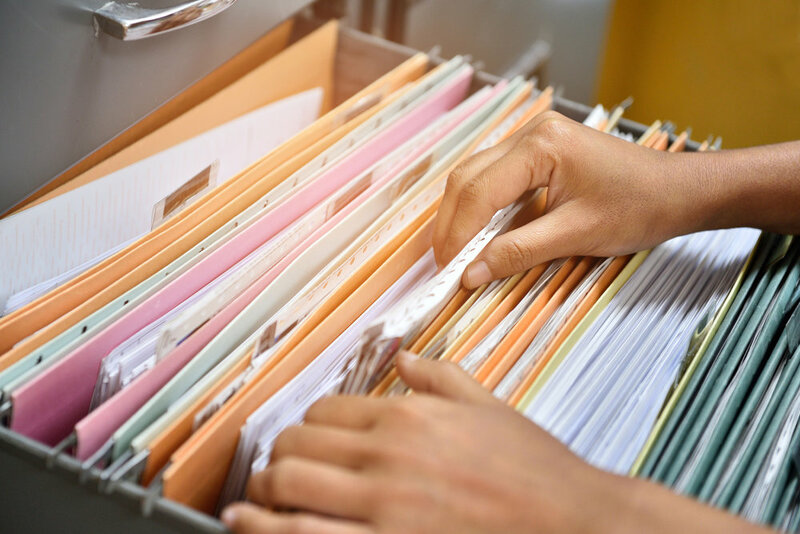 Freedom Filer’s design that makes it easy for you to put away your papers, retrieve them quickly, and clean them out regularly without having to study old paperwork and think too hard. So what is it exactly? Freedom Filer is simply a set of pre-made hanging files grouped into the categories I outlined above. You can dial down in those categories with the files as well, or keep them as broad as I did here. You maintain two years of monthly files – the even year and the odd year, and toss them after two years. Rotating files like insurance policies are orange, and when a new policy comes in, you know to get rid of the previous policy. Permanent files are red. The system provides files to hold up to 10 years of tax paperwork. If you’ve got the time, you can create this system your self with color-coded files and tabs. If you choose to buy it, you can just get the printed tabs, which you’ll have to attach to hanging files you buy, or for a little more dough you can have it set to you ready to file. If you can afford it, I recommend this option – because it means you can start using the system starting the day it arrives with whatever current paper you are ready to file. You can then work your backlog into it as you get familiar with how it works. There’s a bit of a learning curve, but once you get it, things get smoother and paper starts disappearing. If you think this is looking like a good fit for you, you can click here to buy. Paper Clutter Part 1 - Bar the Gate!